As the new year approaches, many of us like to clear out the clutter to make way for a fresh start. Clearing out closets and cabinets is probably the first thing on our list, but many of those old items don’t have to go in the trash right away because they can be reused one more time —as gift wrap! 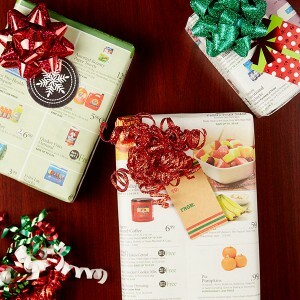 Here are some wrapping paper alternatives to make this year’s gift giving green. Mason jars work perfectly for this purpose, since they are incredibly versatile. 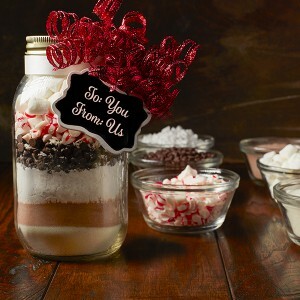 These jars are especially useful if you want to give a gift that is edible. The lids can be decorated and adorned according to your style. If your gift is not edible, adding acrylic paint to the inside can give your jar an artistic flair. Mason jars aren’t the only jars that are good for this packaging option. Any jars that you finish using such as mayonnaise or jelly jars can be cleaned out and repurposed. Even old coffee cans come in handy. Simply remove the label, and voila! You have a blank container for your gift giving needs. Our reusable bags are perfect to hold that special gift. You can choose from a traditional design or use one of our limited edition holiday designs. 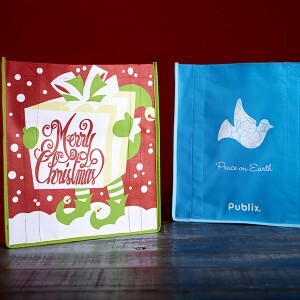 We think your Publix loving family and friends will enjoy getting a surprise in one of our bags. If you have beautifully printed fabrics or old shirts that you’re ready to toss, try using the material as a pretty alternative to wrapping paper. You can take a look at the ancient art of Japanese Furoshiki for inspiration. Furoshiki is a method of wrapping goods in a series of ties and knots to create a practical and eye-pleasing package. Don’t throw out your weekly ads just yet! These flyers can be transformed into beautiful gift wrap — all you need is a little imagination. Weekly ad pages can be used alone for an eclectic vibe, or you can add glitter and stickers for a little flair. You can never go wrong with a touch of sparkle. The possibilities are limitless. Now that we’ve given you a few ideas to get you started, we want to hear from you. What creative alternatives for wrapping paper have you come up with? Share in the comments below.